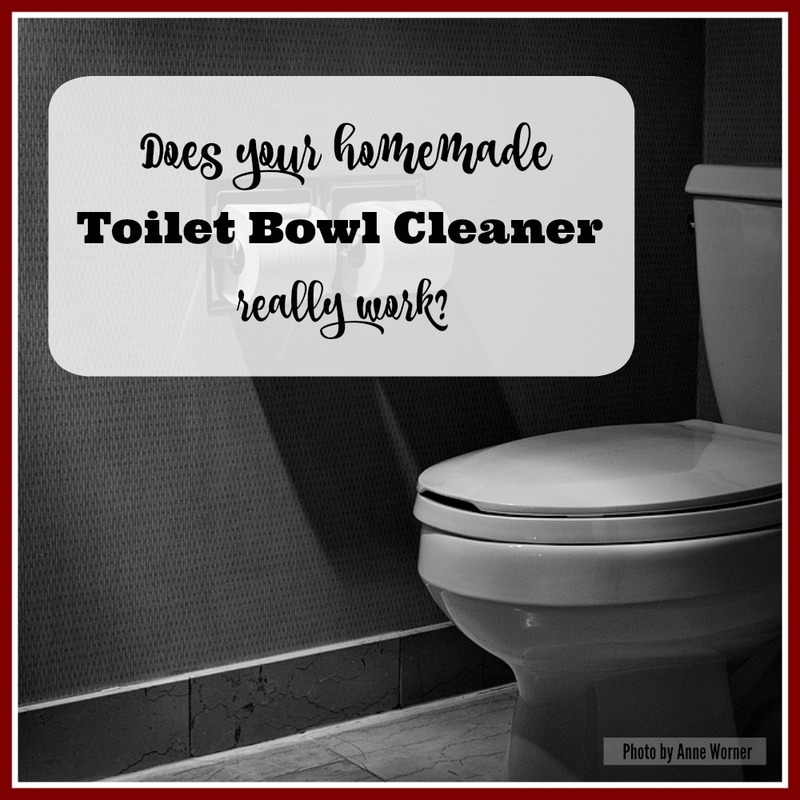 Does Your Homemade Toilet Bowl Cleaner Really Work? Many of us prefer to make our own cleaning products because they are much less expensive than commercial brands. Plus, they’re made from common household ingredients that are non-toxic and biodegradable, so we trust them to be safe for us and our pets, and also good for the environment. And, in most cases, that’s true. However, your homemade toilet bowl cleaner could be deceiving you. Sure, the toilet looks clean when you’re done, but is it, really? If you search the Internet for “homemade toilet bowl cleaner,” you’ll find an overwhelming number of recipes. But, if you look closely, you’ll see most of them are the same—or at least very similar. All the recipes call for baking soda and regular white vinegar. And then, some say to add a few drops of castile soap and/or a few drops of tea tree oil (or another anti-bacterial essential oil). The theory here is that the baking soda will act as a mild abrasive that aids in scrubbing off the grime and hard water deposits. Then, the vinegar, which is 5% acetic acid, will act as a mild disinfectant. Good old fashioned soap boosts the cleaning power. And finally, the tea tree oil, which is a much stronger disinfectant, will blast away what’s left of the germs. If you’ve ever tried this recipe, you know that when you add vinegar to baking soda, it fizzes like crazy. This can be fun to watch, and the fizzing action gives the impression that it’s working. But—here’s the kicker—in reality, it isn’t doing anything! Here’s why. Any eighth grader who’s been paying attention in chemistry class could tell you that baking soda is a base and vinegar is a mild acid. When you mix the two together, they cancel each other out. In this case, it causes a chemical reaction that produces water and a type of salt. It also produces a tremendous amount of carbon dioxide gas, which is what causes all that fizzing. So, at this point, if you scrubbed with the baking soda first before adding the vinegar, your toilet is probably a little less grimy. But it really isn’t any cleaner, and it certainly hasn’t been sanitized in the least because once the vinegar hit the baking soda, it got transformed and lost its disinfectant properties. All that’s left in your toilet now is water and a little bit of salt, neither of which is an effective cleaning agent. If your homemade toilet bowl cleaner recipe calls for castile soap, adding a little bit at this point will at least give you the dirt transporting ability of the soap. Well, maybe… But, if there’s any vinegar left over that didn’t react with the baking soda, then it will react with the soap! That’s because castile soap is a base too—just like baking soda! Vinegar breaks down (unsaponifies) castile soap and reduces it to the oils that were originally used to make the soap. So what you end up with is some whitish, curdled goop floating in your toilet bowl. Even worse than having no cleaning power at all, this oily goop gets all over whatever you were trying to clean, and everything you used to clean it. So in this case, you have a greasy toilet bowl and a greasy toilet cleaning brush. Yuck! This recipe doesn’t seem to be working very well at all so far, is it? The final step, which only a few of these DIY recipes recommend, is to add an antiseptic essential oil, such as tea tree oil. It takes a fair amount of tea tree oil to be effective because it gets diluted when you add it to the water in the toilet bowl. How much tea tree oil do you need? No one seems to know, exactly—although some recipes recommend adding 50 drops or as much as a teaspoon or so. But essential oils are expensive, and some folks feel that adding them defeats the purpose of making your own toilet bowl cleaner because it’ll end up costing more than a commercial product. But, here’s the rub. Even if you decide that adding tea tree oil is worth the added expense, you won’t be getting much bang for your buck because the antiseptic properties of tea tree oil aren’t strong enough to kill viruses and robust bacteria. So, bottom line, that popular homemade toilet bowl cleaner recipe is not much more effective than swishing your toilet bowl out with plain water. Indeed, if you added castile soap, it could be making your toilet even dirtier because the unsaponified oils coating the interior of the bowl provide an inviting surface for bacteria to stick. And finally, the tea tree oil, if you choose to add it, is not an effective antiseptic, unless you add a LOT. But that could bust your budget in a jiffy. And even then, it’s not really doing the job well, anyway. So, if you’re concerned about your family’s health, you might want to avoid “cleaning” your toilet with a homemade toilet bowl cleaner. Can you think of a way to modify this recipe to make it more effective without busting out the bleach or other toxic chemicals? This entry was posted in Homemade Cleaning Products, How-To and tagged DIY toilet bowl cleaner, homemade toilet bowl cleaner on May 21, 2016 by Homesteader's Supply.